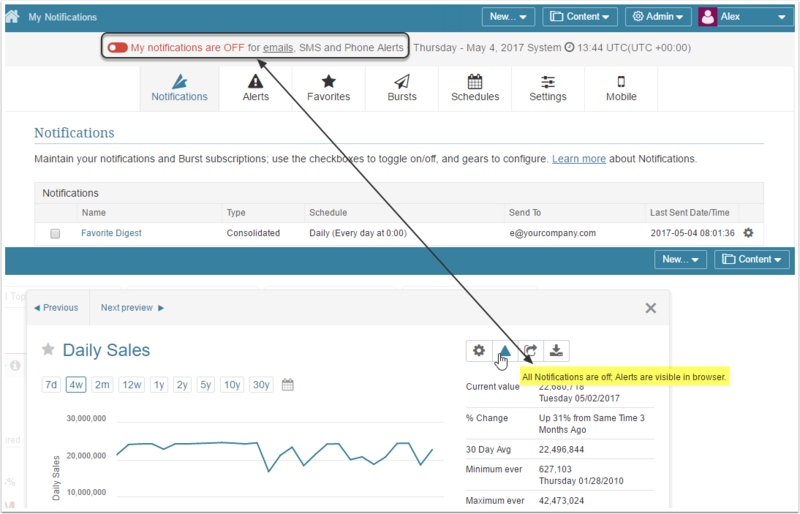 In the Notifications Editor, you can customize a number of essential features of Metric Insights, such as Alerts, Favorites, Bursts, Schedules, your Personal Preferences. 1. What Notifications am I subscribed to? How to set up distribution method/schedule? 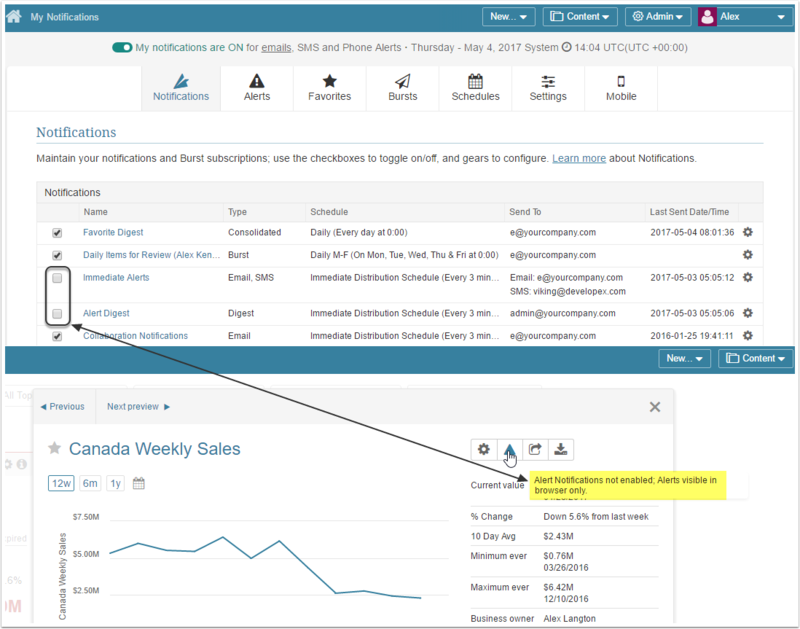 Metric Insights offers several kinds of Notifications which give you freedom to choose what you would like to be informed about either immediately or in an email Digest. 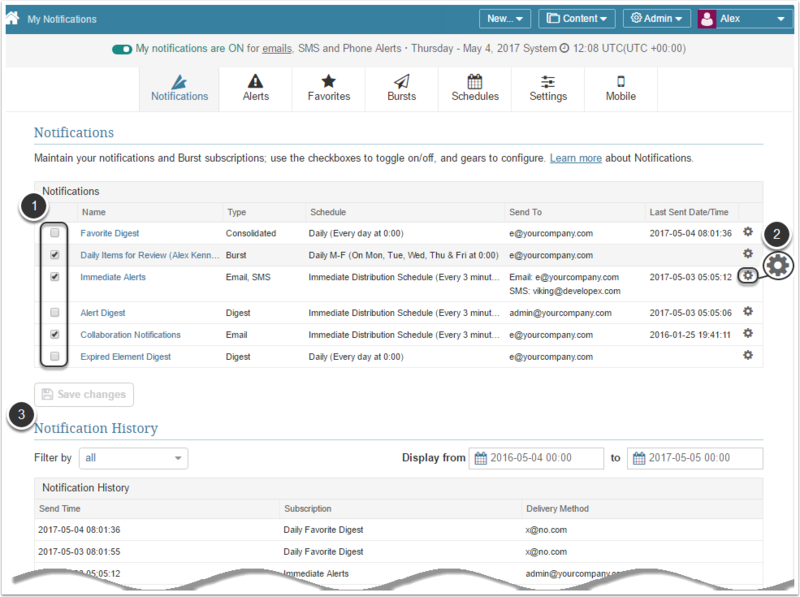 The Notifications table displays all of your subscriptions, their delivery schedule, email address they are sent to and the last sent date/time. To subscribe/unsubscribe from receiving notifications select/clear check boxes and click Save changes. You can configure notifications behavior by clicking a Gear icon in the respective row. If you open a Homepage and look at the upper section of the Left Sidebar, there is a list of your Favorite Folders. Alternatively, access My Notifications > Favorites. These Favorite Folders were either created by you or shared with you. You can choose to send updates per any or all of them on a specified schedule. 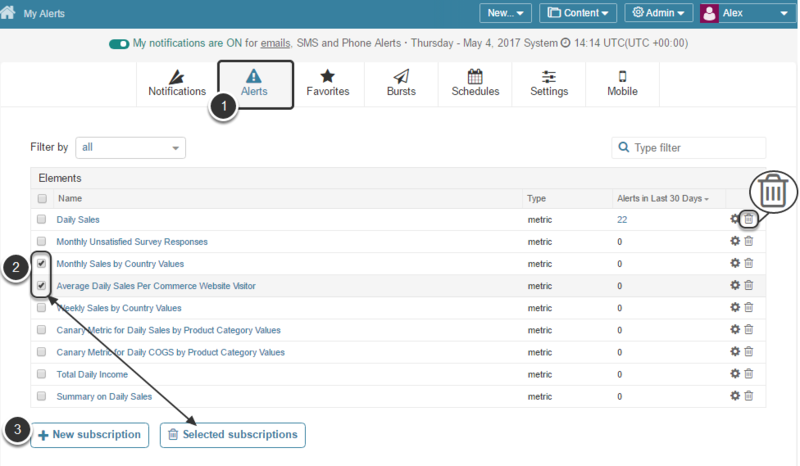 Alert Rules can be created for Metrics, Reports, and External Reports. For example, an Alert Rule can fire when a number of units sold reach the lower threshold level. All users subscribed to this Alert are going to get a notification via their preferred Distribution method. Alert Digest is sent on schedule and includes updates for all Alerts fired since the last email. If you want to stop Notifications from being sent to you, you can either turn them off completely or unsubscribe from specific Types of Notifications, which are described above. At the top of My Notifications screen, you can toggle Notifications OFF, which will stop ALL of your notifications from being sent to you. You will still be able to receive emails on elements or collaborative data that others have shared with you. NOTE: Even if notifications are off, you can receive notifications related to Favorites and Bursts upon request by clicking Send now in the corresponding tab. 3. [Alerts tab] What Elements (Alerts) am I subscribed to? In this tab, you can see all elements with the Alert Rules you are subscribed to. To delete multiple subscriptions, select the elements > Delete Selected subscriptions button becomes active. Alternatively, you can delete subscriptions one by one by clicking a Trashbin icon on the respective row. 4. [Favorites tab] How to manage Favorite Folders? In this tab, you can see all your Favorite folder and any Favorite folders that other created and have shared with you. 5. [Bursts tab] What is a Burst? Burst is a scheduled email notification informing Users about updates for selected element(s). The [+ New Burst] button functions are covered in this article. NOTE: Even if all notifications are disabled, you can receive Notifications for Burst(s) selected from the list by clicking Send now. 6. [Schedules tab] What is a Schedule? When users subscribe to receiving notifications for Alerts, Favorites, Collaborative content, Bursts or expired elements, they can specify how frequently the system should distribute these notifications. Along with the predefined frequencies (such as 'Hourly', 'Daily', etc.) 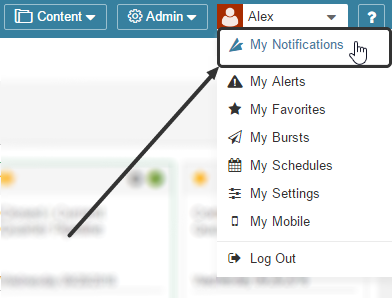 available in the system, each user can create custom Notification Schedules.